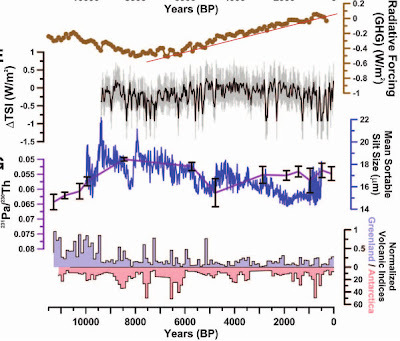 The new Marcott et al bogus hockey stick paper contains a graph showing that alleged radiative forcing from greenhouse gases has been increasing at a linear rate for more than 7,000 years, more than 98% of which was before the invention of the automobile. Human emissions cannot possibly be responsible for a linear increase in greenhouse gas 'forcing' over the past 7,000+ years. In addition, the paper shows that solar activity at the end of the 20th century was near the highest levels of the past 9,000 years. 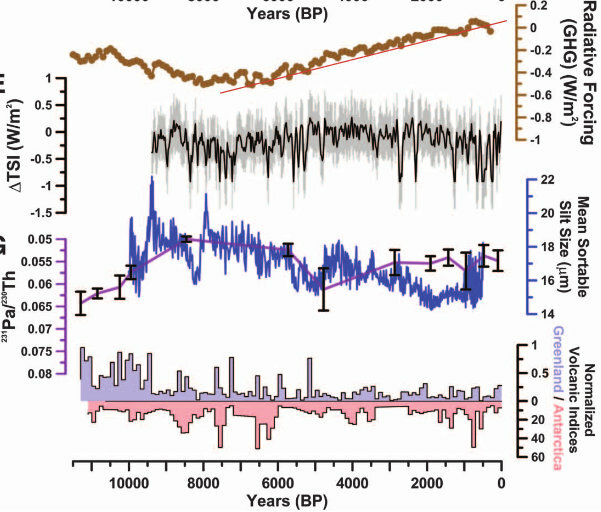 Figure 2 from the new bogus hockey stick paper: Total alleged radiative forcing from greenhouse gases has allegedly increased at a linear rate over the past 7,000 years [added red line in top graph]. Total solar irradiance [TSI, 2nd graph] was near the highest levels of the past 8,000 years at the end of the 20th century.